doug aitken is letting a place speak for him. 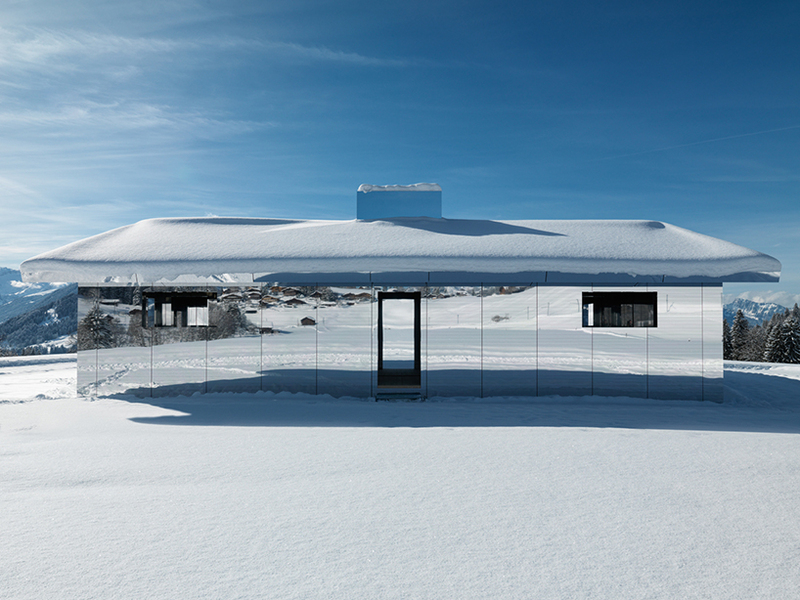 dubbed mirage gstaad, this semi-permanent structure bends the landscape it’s named after. unveiled this coming weekend, february 1 – 3 2019, ELEVATION 1049: frequencies will show off contemporary art, performances, and this site-specific installation by the los angeles-based artist, who once brought us underwater pavilions. 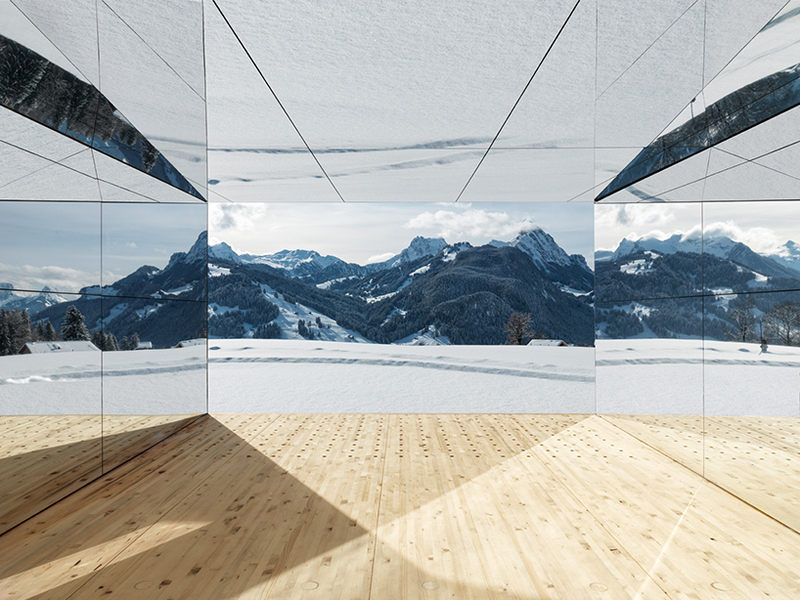 doug aitken’s response to this year’s theme — frequencies — cuts, divides and bends light waves, as every single surface is clad in mirrors apart from the floor. 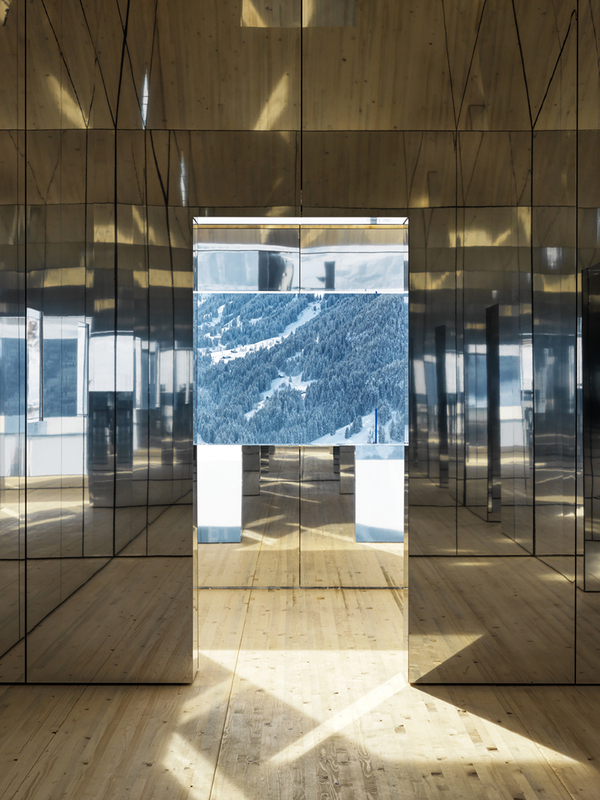 ‘mirage gstaad’ uses the frequency of light to reflect the sublime alpine landscape as part of a continually changing encounter in which land and sky, subject and object, inside and outside are in constant flux. standing in contrast to the surrounding chalets, the ranch-style structure suggests a latter-day architectural version of manifest destiny, the westward migration that began in europe and finally settled in california. the interior is a kaleidoscope you can walk through that reflects a landscape TIME magazine dubbed ‘the place,’ 60 years ago. 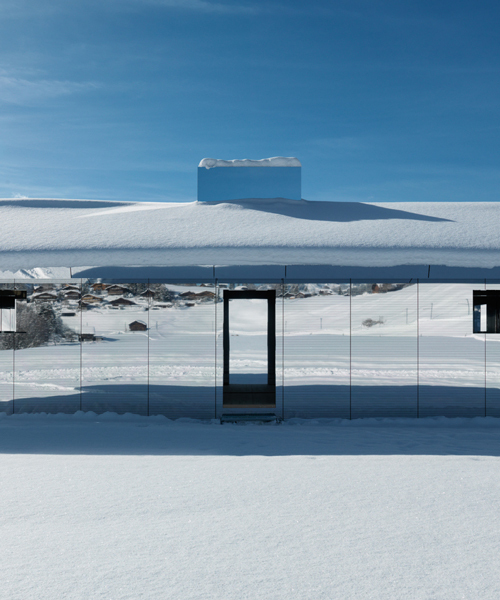 is gstaad still the place? for this mirage, it is. 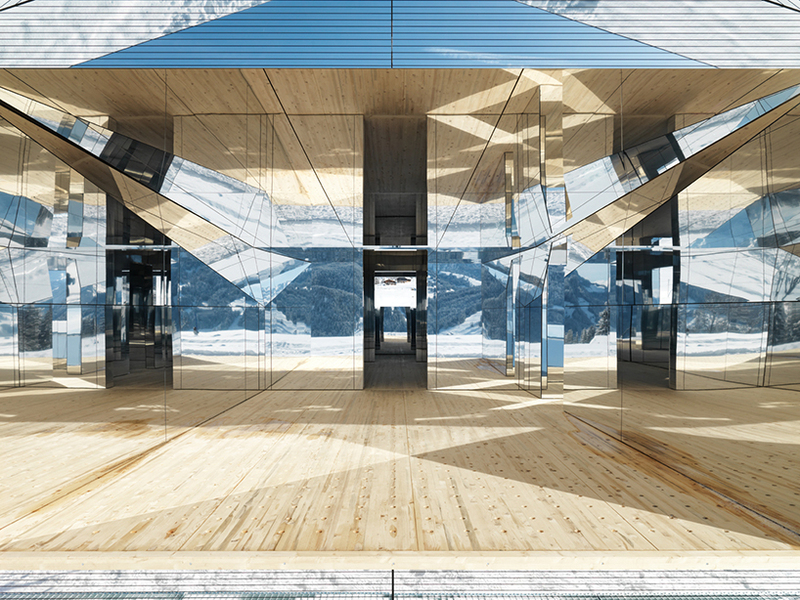 two years for a reflective empty box to sit wouldn’t work or be very special just anywhere, but in gstaad, for ELEVATION 1049, waves of light create beautiful scenes every day. for two years, they can have fun bouncing off doug aitken’s mirage. ELEVATION 1049: frequencies, curated by neville wakefield and olympia scarry, is produced by luma foundation in collaboration with the store x vinyl factory. the main sponsor of the initiative is moncler, which welcomes art and creativity through the support of ELEVATION 1049: frequencies. generous support also provided by alex hank and maja hoffmann (honorary board) and additional support by the benefactors and friends of ELEVATION 1049.
for the opening weekend, ELEVATION 1049: frequencies will bring together a diverse group of international visual and performing artists from multiple generations and backgrounds. 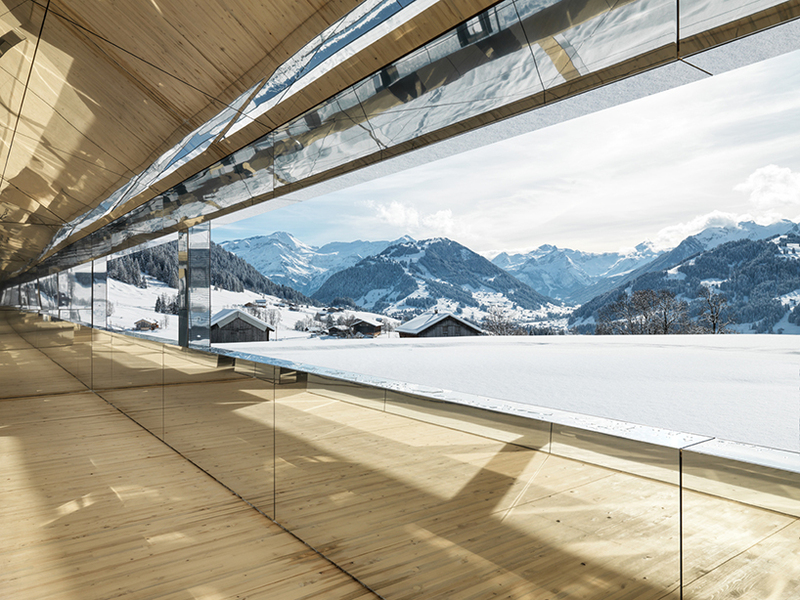 participating artists will present a dense program of live performances in various indoor and outdoor locations in and around gstaad. contributors are: nina beier, suzanne ciani, dominique gonzalez-foerster, zhana ivanova, marie karlberg, liz magic laser, cori kresge and hanna novak, isabel lewis, naama tsabar and marianne vitale. partners and support: generous support by alex hank and maja hoffmann (honorary board) and additional support by the benefactors and friends of ELEVATION 1049.